No one is absolutely sure what long-term pot smoking will do to a person. I mean, sure, there's Paul McCartney, but he's just one guy and he's always been kind of weird, so we can't use him as a reference point. 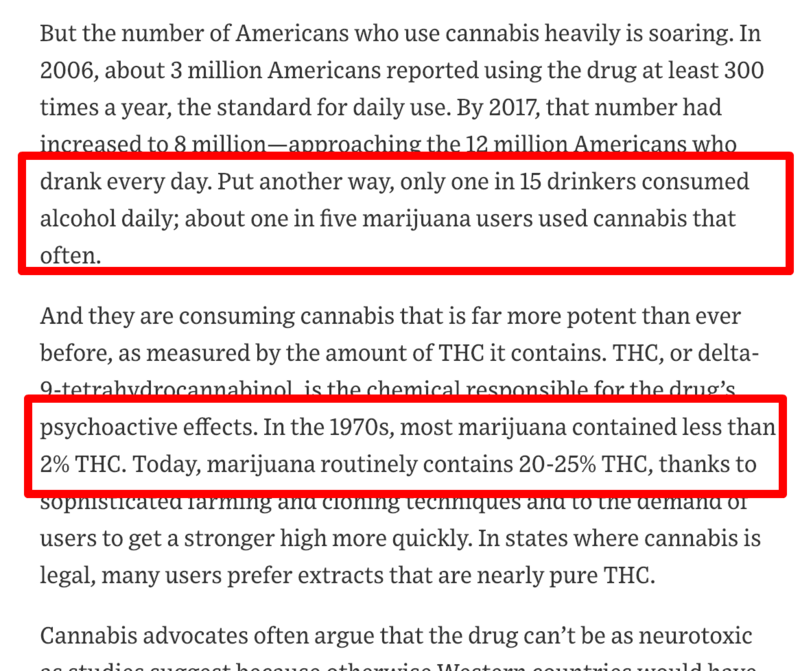 I know some pro-pot (not to be confused with Pol Pot) people who say marijuana helps them get off of other drugs - drugs usually associated with depression. Anti-depression drugs can be psychotropic in nature, can be addictive, can be abused, and can have harmful side-effects, such as liver damage. Smoking pot, the pot advocates say, can eliminate the need for these harmful drugs. But only if pot is supervised by a medical professional, not by the hipster at the corner pot store. I've been around both - alcohol and pot. To be honest, I've never seen someone who is totally baked cause much harm. I can't say that about those who over-indulge on alcohol. Drunks are no fun and they can be quite dangerous. As I see it, if you have to have a vice, you can't beat a good pipe or a cigar. And, as a bonus, they make you look contemplative, intelligent, and approachable. Inhaling smoke that is full of particulates is bad for your lungs. Thus the warnings on packs of cigarettes (leaving nicotine apart for now) and "bad air days" in cities and around forest fires. Effectively smoking marijuana involves deeper inhalation than that of cigarettes and there are at least as many particulates, if not more, in marijuana. It's illogical until you follow the money. Really, it comes down to whether we're referring to peer reviewed medical journals or not. As I understand things currently, what we have at this point is a bunch of anecdotal evidence, but not a whole lot of statistical evidence. We really need the latter to get a good view of what's going on. That noted, the general gist of things is that tobacco actually has far more chemicals that cause lung cancer than does marijuana, and the nicotine in tobacco is physically addictive in a way that THC is not. On the flip side, THC generates "stoner" events like this entertaining account from Maureen Dowd. You then have the question of whether these effects are temporary and (mostly) harmless, or whether they are permanent and or (often) very dangerous. As far as I know, statistically the jury is still out on that. Is there a relatively safe dosage, or not? No argument with Ron that inhaling smoke of any kind is probably not the world's best idea (BBQ anyone? ), but again....BBQ anyone? Campfires, smores, etc..? If we're going to make policy, maybe some....good numbers? Some idea of....relative risks? Regarding why we don't have good numbers, the reality is that if you want to do research with marijuana in the U.S., you are buying the "lab supplies" from the DEA, which of course has a vested interest in current policy, and the end result is that their 12 acre plot on which they're said to be growing the samples is usually not even planted. Put mildly, I can't blame researchers for not doing research where a clerical error can result in the end of one's academic career, or even jail time. Moreover, speaking of "good numbers", it's worth remembering that (H/T Greg) when the EPA did their groundbreaking study on second hand tobacco smoke, they did NOT initially find statistical significance at the 95% level (standard), so they reduced their confidence level to 90%--and a judge who understood statistics better than average publicly rebuked them for it. Didn't stop a slew of laws regulating it, though, including some here in Minnesota. So sadly, one of the things you've got to watch for in this area is people throwing around insufficient evidence to make their point. Following Ron's comment, here is a brief report about marijuana sales in Canada following legalization. I'm old enough to remember when cigarettes were recommended by doctors in advertising so excuse me if I don't buy into the "less harmful than cigarettes" hype. In college, a guy in the room next to me was smoking marijuana, playing with a hunting knife, and sliced the palm of his hand with the knife. His friend took him to the ER, yet the entire time this guy never felt it, laughing the entire time. I can't remember anyone having that reaction from tobacco. Pot usually comes with a culture. This culture includes those who worship the stuff. That is not an exaggeration either. It often affects a person's ability to reason maturely. Oh, and it really stinks! Oh the things you learn from reading Sharper Iron! After reading this post on S.I. I was curious about slang for marijuana, so just for kicks I looked it up. I had no idea until a few minutes ago that "mowing the grass" is slang for smoking it, that a "Jim Jones" is a combination of marijuana and cocaine or that a "Fry Daddy" is marijuana with crack. But, my all time favorite is Hippie Lettuce. :-)!! But, at least marijuana isn't as bad for you as gluttony. This is true. And I believe there's a whole religion built around it, where it is called ganja, the holy herb, and even the weed of wisdom. I'm talking, of course, about Rastas, mon. There pot is looked upon as a healing herb that will bring the nations together. Scripture referencing God's command to eat/use "the herb of the field" is used to back them up. So, yeh, mon. It is worshipped. Not a stretch. This is really a decent illustration in what's at stake with marijuana laws. Is our premiss that we ought to make these laws on the basis of body counts, man-years lost, etc..? Then we'd better ban high fructose corn syrup and the Old Country Buffet first, not to mention tobacco and motor vehicles. And then we'll learn exactly how many people can die on bicycles, I'm sure. Or perhaps, are we willing to say that the use of one substance is more significant because the disasters with it are more graphic? OK, then what about motor vehicles again? What's our criterion? If we say it's wrong because there is a religion (really a few) built around it, haven't we wandered in front of the muzzle of the 1st Amendment? No doubt there are some pretty nasty stories to be had about the drug. I linked a few of them myself. The question, however, is whether we can demonstrate a relative risk that is unacceptable compared to other things that we allow, and again, do we have sufficient evidence? And if not, are we willing to take steps so we actually know? Yes, Rastas worship it in a sense, but I'm talking about a whole different set of people whose whole life is centered on pot. They don't care about anything but weed. Bad news legalizing it for recreational use. If your going to legalize pot recreationally then you might as well legalize heroin under a Doctors care. Heroin users can stay on low doses for years. That’s what they do in England. To me it’s an all or nothing proposition. Put sin taxes on pot and heroin and take organized crime out of the equation. I’m only for strict medicinal use like Pa and no smoking forms are sold in Pa. I’m still exploring using it due to my fear of opioids but the low doses I use cost me $1.50 a month versus $100.00 a month for marijuana.